Michelle & Barry Soetoro With President Susilo Bambang Yudhoyono & His Wife. 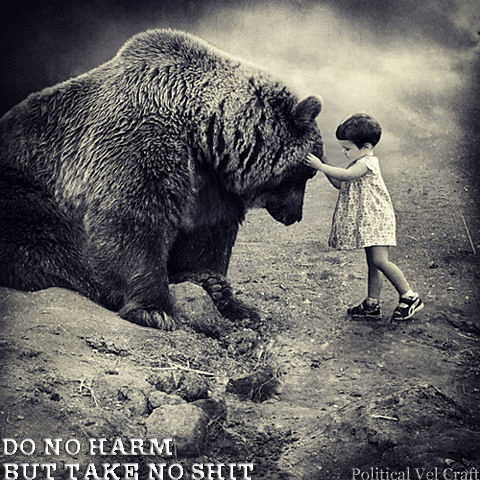 This may look like an amicable meeting but the NWO just tried to murder him. 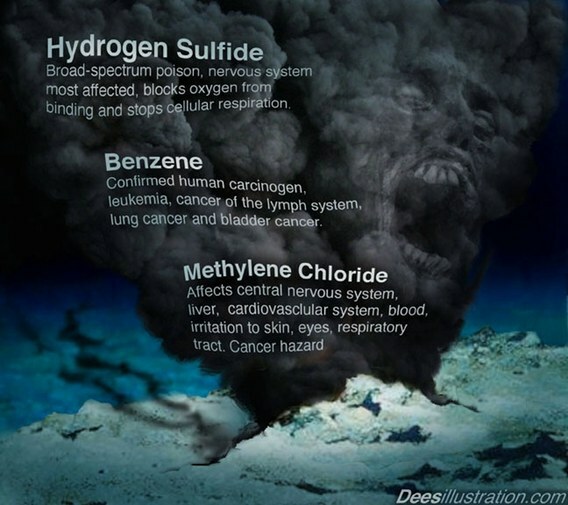 If you think British Petroleum’s act of Eco-Terrorism upon the United States was bad, listen to this, (THE CONTRACTOR) British Petroleum unleashed (drilling accident) a toxic lava mud flow that spans from Indonesia all the way to Australia. This drilling ‘accident’ occurred in 2006 and the toxic mudflow continues to Australia. This toxic mudflow now under the ocean has caused great loss to Indonesians to date, but the NWO owned controlled MSM keeps this all under wraps. Why was this done? This was all done to subjugate island Nation States to the power of the Mafia aka; Rothschild Banking Cabal, under the rubric of an expanding Earth surface theory that will raise the ocean waters and swallow their nation states unless they submit to the will of NWO corrupt scientists who can come and save the day. BRITISH PETROLEUM’S 2006 INDONESIAN ECO-TERRORISM! Indonesia’s 2006 BP ‘Accident Happened The Same Year As Prudhoe Bay 2006 BP Oil Spill Accident. For four months, toxic mud from deep underground has spewed to the surface due to negligent drilling at a gas exploration site in the Porung sub-district of Sidoarjo, a regency in the east part of main Indonesian island of Java. The homes, fields and workplaces of thousands of local people have been submerged and far more are at risk as attempts to stop the flow fail. 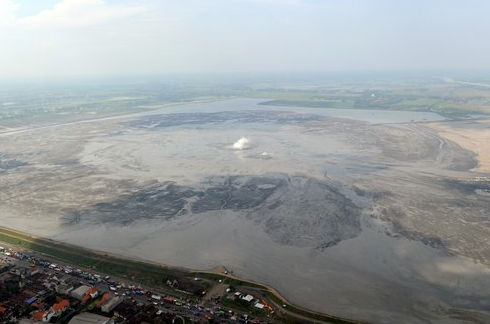 The mud flow has become as a major social and environmental catastrophe, with potentially far-reaching political consequences for Indonesian president Susilo Bambang Yudhoyono. The mud began to surface at the end of May. The cause, according to mining and environmental sources interviewed by the New York Times, was the failure of the drilling contractor to seal the walls of an 8,500-foot deep well with concrete, a measure required under Indonesian mining legislation. The major partner in the gas exploration joint venture was Lapindo Brantas, a firm owned by the family company of Aburizal Bakrie, welfare minister in Yudhoyono’s cabinet. The other partners were Medco Energi Oil & Gas, Indonesia’s largest listed energy firm, and the Australian-owned mining giant Santos. 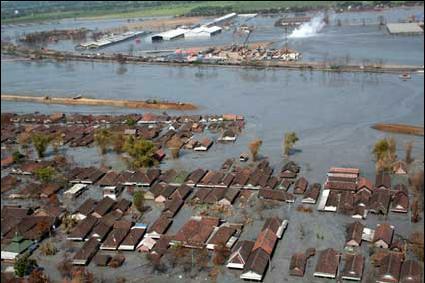 Tragedy ‘Lapindo Mud’ began on May 27, 2006. Originally mud was spurt in the rice field close to the gas drilling owned by Lapindo Brantas contractor. Lapindo Brantas is one of the Production Sharing Contract appointed by BP-Oil and Gas to make the process of drilling for oil and gas. Currently, Lapindo has a 50% participating interest in the area of Brantas, East Java. On May 28, 2006, PT Lapindo Brantas (British Petroleum) targeted gas by drilling a borehole named the ‘Banjar-Panji 1 exploration well’. In the first stage of drilling the drill string first went through a thick clay seam, volcanic debris and finally into permeable carbonate rocks. At this stage the borehole was surrounded by a steel casing to help stabilize it. At 5:00 a.m. local time a second stage of drilling began and the drill string went deeper, to about 2,834 m (9,298 ft), this time without a protective casing, after which water, steam and a small amount of gas erupted at a location about 200 m southwest of the well. The extra pressure formed fractures around the borehole that propagated 1-2km to the surface and emerged at the surface. 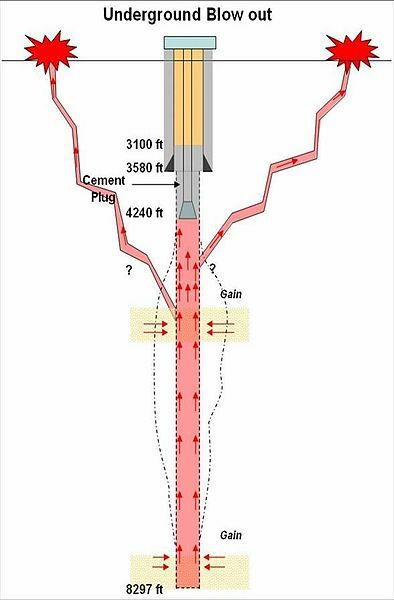 The most likely cause of these hydraulic fractures was the unprotected drill string in the second stage of drilling. Borehole protection by steel casing is a common procedure in oil or gas exploration. The negligence allowed mud to seep into the well and, under high pressure, rush upward. The plugging of the well did not stop the disaster as the mud found other routes to the surface. Initially, the rate of flow was 5,000 cubic metres a day. By mid-June, however, it had reached 50,000 cubic metres and is now believed to be rising at a rate of 130,000 cubic metres per day. 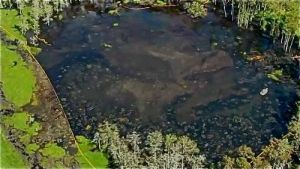 An area of 400 hectares (988 acres) has been submerged by a mud lake with high concentrations of hydrogen sulphide and a temperature of 60°C. Hundreds of people have been hospitalised with respiratory problems and over 13,000 people have been made homeless. Eight villages, more than 500 houses and 20 major factories have been submerged, along with more than 100 small to medium businesses. The mud has engulfed highways and rail lines, disrupting the transport of people and goods between Sidoarjo and the major port city of Surabaya. On the issue of education, after 33 schools were drowned by mud, to date not a single replacement school built by the government. Dams have been raised to contain the mud. Their walls, however, have had to be repeatedly raised as the sludge continues to pour out. The walls of the smallest dam are now 5 metres high, while the largest has levies 15 metres high. Dam walls have collapsed at least three times. Torrential monsoon rain will begin striking the region soon and there are fears it could cause more dam failures. 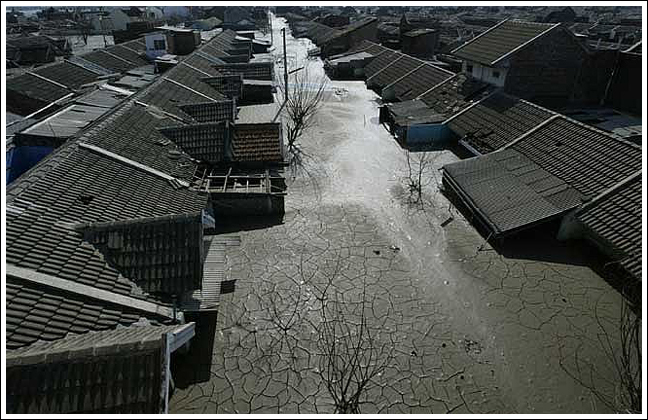 At least 6,000 houses are threatened by a major spread of the mud lake. The measures being taken are based on the hypothesis that the mud flow will cease soon. Another hypothesis being considered, however, is that the drilling has triggered a “mud volcano”, in which a vast reservoir of mud and gas trapped three kilometres underground is being forced to the earth’s surface. 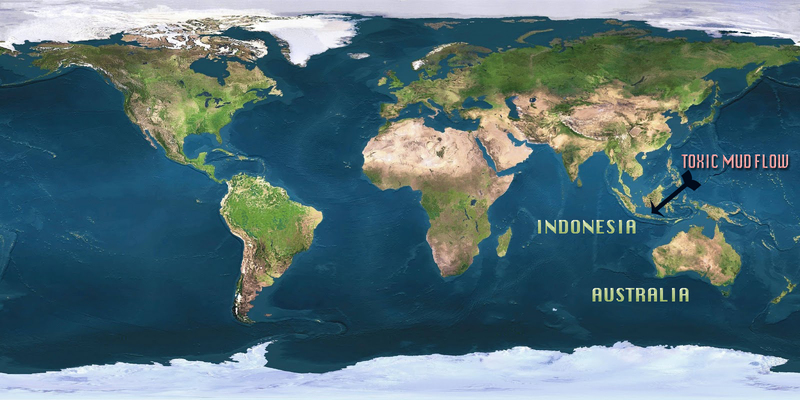 If that is the case, the mud may rise for decades with major implications for Java, the most populated island of the Indonesian archipelago. Preparations have been made to pump the sludge into the nearby Porong River, which flows into the sea approximately 20 kilometres north of the mining site. The environmental and economic consequences of such an action would be considerable. The injection of the sulphuric muck would alter the ecosystem of the river and most likely pollute 1,600 hectares of fish ponds. By 2011 10,000 families have lost their homes. The enormity of this unravelling disaster is producing a significant political crisis. Yudhoyono’s government is being accused of attempting to protect Lapindo because it is owned by Bakrie, one of the wealthiest men in Indonesia and a senior leader of Golkar, the party of former dictator Suharto. 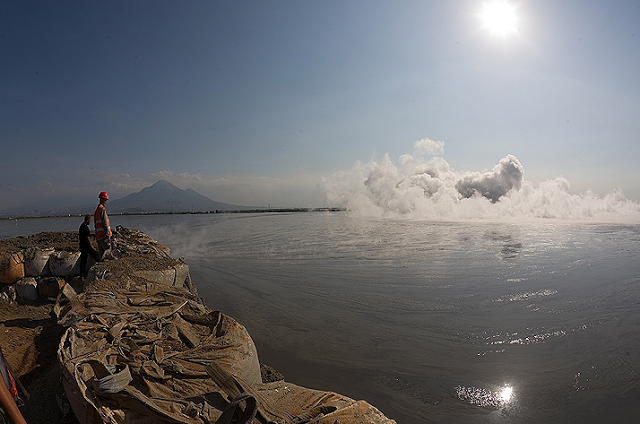 At a parliamentary hearing in early June, representatives of Lapindo blamed the mud volcano on an earthquake that took place on May 27 near the city of Yogyakarta—the day before the mud began to rise in the well. The Indonesian oil and gas regulator, BP Migas, supported this argument. Government geologists testified it was hard for companies to predict such an event due to the complex nature of the country’s geology. 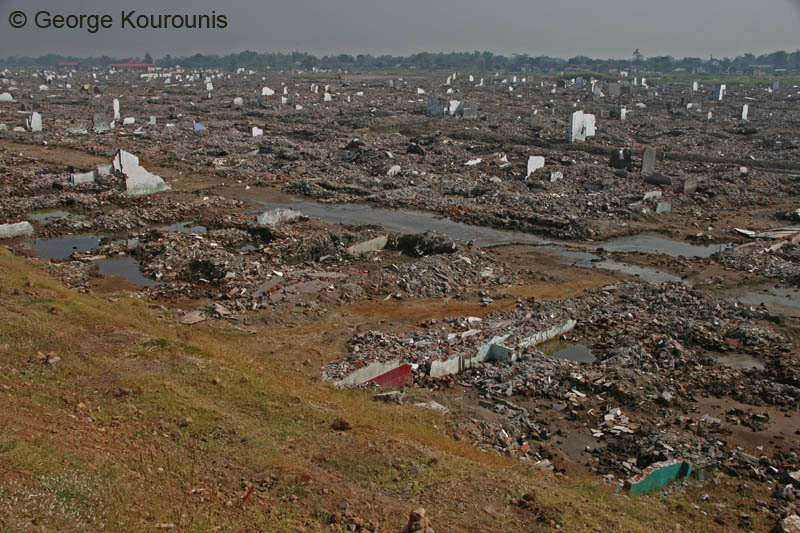 Bakrie summed up the official indifference toward the villagers whose livelihoods have been destroyed. As the mud engulfed hundreds of homes, he refused to visit the region and stated he had no responsibility. The attempted cover-up came unstuck, however, when a letter from Medco Energi Oil & Gas dated June 5 was made public, accusing Lapindo of gross negligence. The letter stated that Lapindo had ignored a reminder to put in a nine-inch (22.5cm) thick casing in the well to a depth of 8,500 feet, as was the industry standard. The estimated saving of not putting in the casing was just $1 million. Surabaya’s Institute of Technology also damned Lapindo for negligence. It accused the company of drilling without a casing despite the high risk of a blow-out, of removing the drilling rig and delaying the process of plugging the well, of inadequate action to dam the mud flow and of not alerting the public quickly enough to the threat posed by the rising mud. A number of geological experts rejected the claim that the earthquake was responsible as its epicentre was 300 kilometres away from the drill site. The effects of the quake in Porung would have been minimal. Questions have been asked as to whether corruption was involved in the regulator BP Migas accepting the company’s argument that an earthquake caused the mud flow. Environmental law expert Mas Achmad Santosa told the Asia Times Online in July: “There shouldn’t have been negotiations [between the government and Lapindo]—all meetings and talking. Coercive enforcement should have gone hand-in-hand with the criminal proceedings.” Citing Santosa, Asia Times wrote that the situation in Sidoarjo was “a clear example of corporate negligence, and that the government has become directly involved”. Further questions have been raised about why BP Migas gave the exploration contract to Lapindo in the first place, as Bakrie’s company had no experience in drilling at such depths. As evidence of a cover-up has emerged, Sidoarjo locals have held angry demonstrations against government officials. During a protest on August 22, which targeted the deputy regent of Sidoarjo, Syaiful Illah, banners were carried reading “The rulers are free, the people suffer”, “Syaiful is Lapindo’s lackey” and “Lapindo and Syaiful must buy our houses”. On September 4, villagers threw rocks at police outside the main office of the regency authorities. Prudhoe Bay Oil Spill Accident BP Was There. 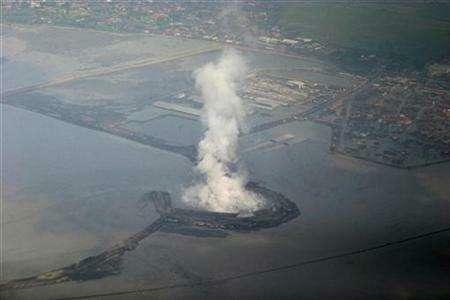 Indonesian Toxic Mud Flow Accident BP Was There. 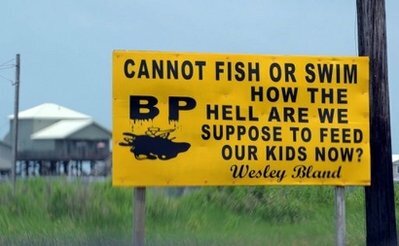 Gulf Coast Toxic Oil Spill BP Was There. 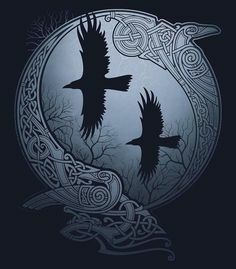 British Petroleum has (4) direct links to Bilderberg/Illuminatis: former CEO John Brown, Chmn Carl Henric Svanberg, CEO T. Hayward and… Peter Sutherland 2009 BP Chairman & Chairman Goldman Sachs..
BP was founded in 1909 as Anglo-Persian Oil Company; 1954 renamed British Petroleum Company; 1998 merger of British Petroleum and Amoco total assets $236B FY 2009. Anglo-Persian Oil Co explored (plundered) oilfields of Persia (Iran). BP is 3rd largest oil-oligarchy, and 2nd most lucrative asset of Black Nobility Rothschild Mafia (see on this blog Speaking With One Voice). Rothschild’s funded oil magnate John D. Rockefeller’s Standard Oil (now Exxon Mobil). In the face of the questions and discontent, Yudhoyono’s government guaranteed that Lapindo and the Bakrie family would compensate the people who have been affected. According to the New York Times, however, Bakrie’s firm sold off Lapindo last month for $2 to a shelf company registered in Jersey. The company, named Bakrie Oil & Gas, has assumed all responsibility for the disaster but it has no apparent assets. The Times cited speculation that the company may soon declare bankruptcy to avoid paying the compensation and clean-up costs which are now estimated at over $US1 billon—and will soar if the mud flow does not stop. The Indonesian government will either have to foot the bill itself or risk an eruption of social unrest.